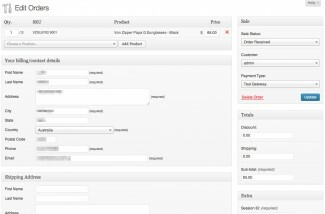 Edit existing Orders within WP e-Commerce. Looking for support, a copy of the readme, Plugin updates, Ideas or usage instructions? Check out our Documentation for Edit Orders. There are two issues that seem to be a problem. The one has been ongoing in various forms and the other is new. 1 – When an order is edited for a second time, the first product is added again as another item (this has happened in various forms, previously as a 0 priced item) a pattern I think I may have found is that the product duplicated is usually the first item. 2 – When adding a product to the order, if a product has variations and a variation is out of stock, then the entire product is disabled in the dropdown. Please address these issues asap. Hi Veronica, the first issue has been resolved in the next Plugin update due for release shortly/later today, this will be a major update with alot of changes I’ve been working on. Once that’s out in the wild I’ll look into why an entire Product is marked as unavailable when a single variant is out of stock and will promptly issue a minor Plugin update to resolve this. I have been trying to reach you guys via forum, email, support, contact. It seems no body care here after you pay for the buggy code. Hi sami1255, we’re here. It’s just the weekend right now so we’re either having a weekend or in my case spinning up a major Plugin update for Edit Orders. I’ll swing past your topic shortly. 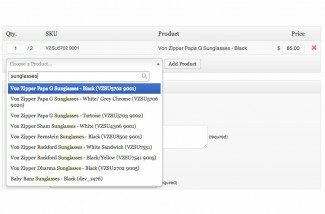 If you are trying to add a product to the order, only some of the products appear in the dropdown list. Probably only about 1/6 of our products are in this list. Fiddling with the order trying to add another different product actually resulted in duplication of the product already in the order. Hi Jo, I’m reproducing these issues and will respond shortly. 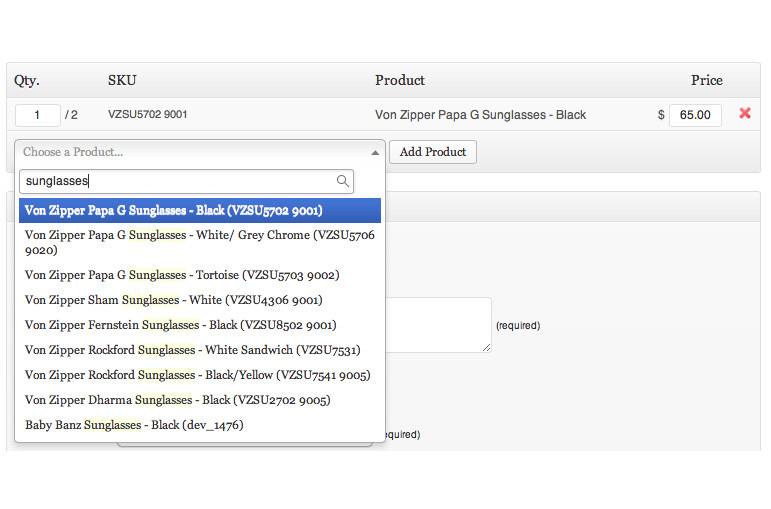 I’m loading up a clean sample store to reproduce the order duplication issue when editing existing orders. It seems that if a product has variations and one of those variations is out of stock, the product is in the list but disabled. Not really ideal. Could a fix for this be added to the new release? Do you know when it might be ready? Say someone orders 2 products, and I want to delete one off their order (maybe it was actually out of stock – a separate wpec issue), it does remove it from the order but it duplicates the product remaining so the count is still 2. I am removing the product by clicking on the red cross and clicking update. Hi Jo, I’ve patched this issue in the next Plugin update, it’s due to us not touching the wpsc_claimed_stock. I was letting WP e-Commerce manage this but it looks like we need to intervene when adjusting cart quantities using Edit Orders. Okay so this is the third time I am requesting this, I am hoping a public forum will get a response. I have sent two emails to you requesting the link to the updated plugin as it is not available in my client area. I do not want to pay for it again. I have now waited 48 hours for your response as indicated in your support section, but have not received any. I need to update my client’s site, please send me the link or tell me how to get the updated plugin, barring spending $65 again. Is there a way to extend this to allow orders to be placed via the wp admin console? Would be useful in scenarios where customers call with technical issues. Love the edit order functionality for changes to orders (like size, etc). Works great thanks! 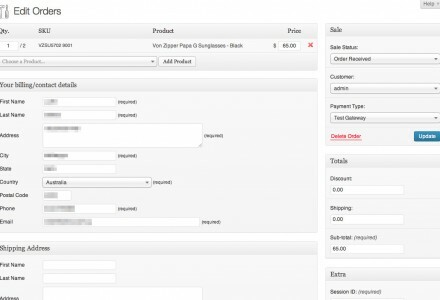 Hi Rob, this can be done with our Manual Ordering Plugin that adds an ‘Add Order’ menu link to the Products menu within the WordPress Administration, it’s ideal for call-ins. Hi I have the same problem. This plugin conflicts with three plugins that I use (if I deactivate the plugins the edit orders plugin works, if I activate them, I get the same problem as you). I have asked for assistance by sending two enquiries via the contact form and have posted on the forum but am still waiting for some acknowledgement from the developer. Hi VeronicaClare, I’ve forwarded your support onto my colleague who can assist with making our Plugin compatible with other WordPress Plugins, jQuery either works well or not at all so if we can help the other developers we’ll do our best. You’ll be contacted shortly for more information. Hi mido, I’ve raised this with my colleague to investigate further. I have a huge issue. When i change the product price and hit update, the product price jumps down to 0, but the total price is still the same. My client must have his site up pretty soon and with this bug i cant go live with the site. Any fixes? I really need this o be fixed! I cant update the product item, as soon i hit update, the product item is displaying 0 instead of the value i typed in. The total price doesnt update either, and when im trying to remove a product item i get a error-message. Hi Ted, thanks for raising this. 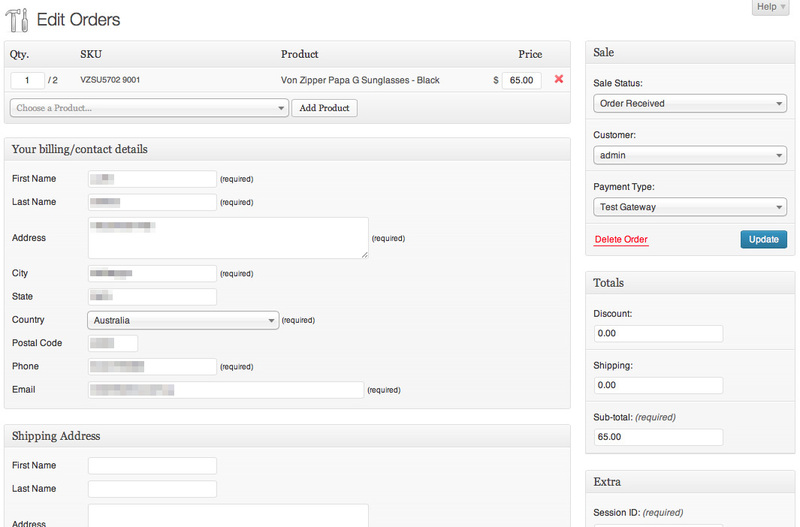 I’ll reproduce this and issue a Plugin update to add compatibility with WP e-Commerce 3.8.8. I tried it on e-commerce 3.8.8 and i still get the same errors. But i think i found the cause for the problem. Im using swedish krona as the currency, and thats when the problem starts. When i change the currency back to lets say australian dollar then the item price saves when i hit update. So it has something to do with the currency. Another thing is when i click edit sale within the sales-log details all fields is reset, so i must go through the products->edit orders otherwise it doesnt work. I managed to fix the problem. It was all about the currency! Since im using swedish krona, the currency symbol is SEK, and not $, £ etc. So its 3 letters not 1, so i had to change the code in wpsc-admin_eo.order.php at line 43 so that it would substract 3 instead of 1. If anyone using the plugin and has a currency code with 3 letters, this is what you must do in order to make it save properly. Plugin is now 95% working. there is nothing stopping someone from using this plugin at this time. There is a couple small bugs but nothing to big, will report on them later. Please see my comment below – still some bugs which don’t update the total cost, shipping costs, etc. Plugin doesn’t work at all! I’m having the same problems. Fingers crossed @Michael pops up again soon. Coming to the rescue, prepping a minor Plugin update that has an override for wpsc_get_action() to sort this out, the cause remains the same, one of the Plugins in the suite is loading an old copy of this now crucial function. @laura most the problems are fixed now. Thaks – will have a look. Your billing/contact details is a required field. Shipping Address is a required field. Although these fields have been inputted! (3) When I press send an update email to the customer – the product list has changed as per my changes in the product details box. But the total/shipping/etc still remain as they were. For example, my original total was £1. I added two new products, such that the total should be £5. However, the total still remains at £1. Can you please have a look and fix these as I can’t do much with this plugin as it is! (1) When I add a new product or delete a product from the order, The total does not update in the box with the shipping price, etc. Just want to confirm that we can edit the shipping total of an order . Probably should have said I need to confirm that edit shipping had been added. Anyways, bought the plug in and added it to my clients test site. The plug in seems to have installed properly and has the edit orders links, though when I try and edit the order nothing seems to happen. Will write up a detailed report in the morning. I made a quick screen cast walking you through all the bugs that i could find. The plugin is not working just like @dunskil said. Is there a place in the forum we can more this conversation too? Here’s an existing topic we can work through this. When i edit a order its gets removed from the customers history. This is a BIG DEAL!!! what can we do to fix this. or how do i go about getting a refund? Hi easilyamused, I agree that Sales unlinking from a customer’s account is a big deal so let’s get this resolved. This has been working in prior releases so could be due to a change in WP e-Commerce; happens from time to time. I’ll look at this on my end using WP e-Commerce 3.8.7.1 and the latest Plugin update, feel free to e-mail or Skype me any additional site details, thanks easilyamused. Thank you for the update, and i do understand. We are kinda on a tight dead line. Do you think you will have this fixed in a day or so? Also any update on the editable shipping? Any update on the orders dis-attaching from user history or editing shipping cost? Just looking for an update. Is it possible to edit the shipping total with this plug in. I’ll second that! I just came in to look for that ability as well. Hi Andrew, currently you can only select the shipping method, not adjust the shipping total. That said I’m prepping a wave of Plugin enhancements for this week so have added an Idea to track this development. What about adding the ability to add an item to a order? Hi. So sorry to send multiple emails…that wasn’t my plan. I just forgot to mention my other question. Here it is. This plugin initially looked to be exactly what I need, because my client is having issues with orders placed, and they need to go back in and manually edit the orders. But the thing they need to edit is the Personalization field. And from the screenshot above, it doesn’t appear that this is one of the things that can be edited using this plugin. Am I correct? And if so, I’d like to know how much it would cost to sponsor the addition of this field to the editable fields for this plugin. Hi Derek, just confirming that you can view Personalisation details and I’ll cook in support for editing this in a future Plugin update. Is there a way to add new orders using this plugin? This can be done with our Manual Ordering Plugin that adds an 'Add Order' menu link to the Products menu within the WordPress Administration. Edit Orders comes with a Quick Start document (readme.txt) to help with installing the Plugin. Additional support can be found from the Contact page or methods below. If you have any problems, questions or suggestions please join the members discussion on our Edit Orders forum. This Plugin allows store owners to alter existing Sale details generated by WP e-Commerce through the WordPress Administration. 1. Upload the folder 'wp-e-commerce-edit-sales' to the '/wp-content/plugins/' directory.